Say hello to Squalus clarkae, otherwise known as Genie’s dogfish. This newly identified species of deepwater shark was named in honour of Eugenie Clark, a scientific pioneer who influenced an entire generation of marine biologists. Few people have done more to improve the reputation of sharks in the public’s mind than Eugenie Clark, who died in 2015 at the age of 92. Known as the “shark lady,” she founded the Mote Marine Laboratory in Sarasota, Florida, and was an early member of the American Elasmobranch Society. Among her many scientific achievements, Clark discovered several new species of fish, and learned that some species of shark don’t need to swim in order to breathe. She also conducted some of the earliest research into shark behaviour, showing they’re more than just mindless killing machines. Over the course of her career, Clark received numerous awards and honours, including a 1996 Emmy Award for her underwater films. 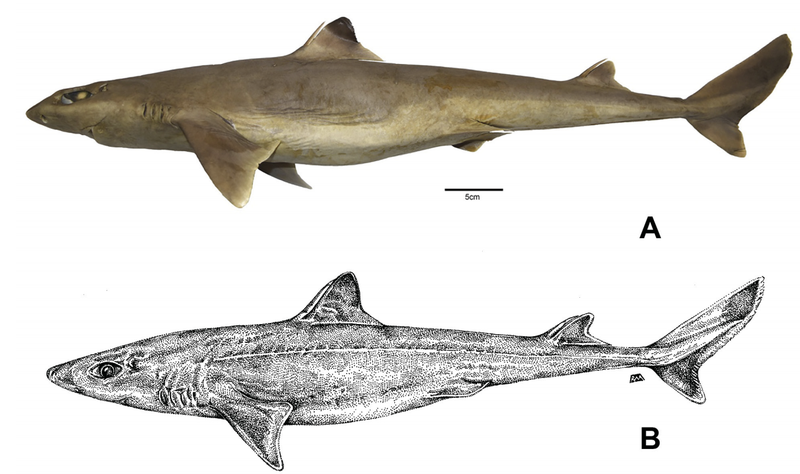 And now, fittingly, a newly discovered species of shark has been named in her honour, the details of which were published this week in the science journal Zootaxa. The new shark, christened Squalus clarkae, is a member of the dogfish family, which all tend to look alike. These modestly sized deep-sea creatures feature slow reproductive rates and low genetic diversity, making them difficult to study. Previously, marine biologists had mistakenly conflated S. clarkae with another type of dogfish, Squalus mitsukurii. But genetic testing and a thorough analysis of its physical characteristics revealed Genie’s dogfish, as it’s also called, as a distinct species deserving of its own name. Genie’s dogfish can be found in the deep waters of the Gulf of Mexico and the western Atlantic ocean. Compared to other dogfish, its distinguishing features include a longer body, a tighter gap between its eyes, a shorter caudal fin (its tail fin), and a differently proportioned first dorsal fin. A few other fish species have been named for Clark, including Sticharium clarkae and Enneapterygius clarkae.